A few years ago my team at work held a bake-off. I pretty much had it in the bag between a bread pudding (that I have yet to write about) and Sherry Yard’s Triple Silken Pumpkin Torte. And then in walked…this other person, carrying her entry, a large pan of macaroni and cheese. She won. I came in second and third. And I have never gotten over it. Mac and cheese is baked, yes, but the spirit of a bake-off is sweets. I mean (as I have said countless times), you wouldn’t bring a baked chicken would you? Would you? Harrumph. Pffft. I’m still peeved. But as it’s going on 5 years ago now, let’s consider this post a healing. 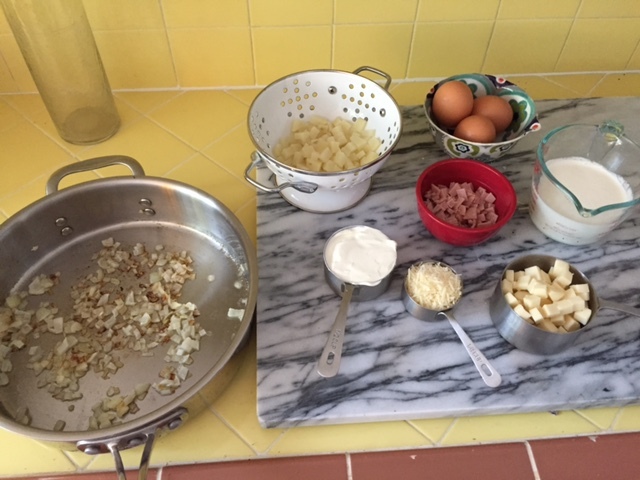 Because here I am, presenting to you on my very own baking blog, a recipe for quiche. 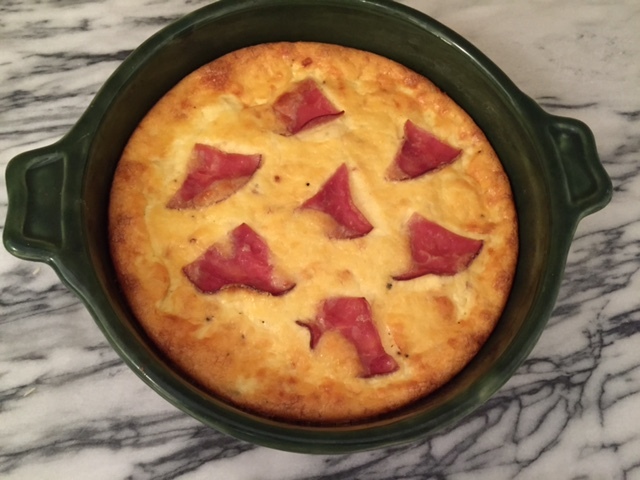 I’ve been serving this Ham and Potato Quiche for nearly 10 years. From the first time I made it (using a recipe that Russ Parsons wrote about in the LA Times), it has been my go-to quiche. Before then, I used to make up my own combinations and was rather known for my wild mushroom and smoked gouda tart. But then this happened. The article focuses on Thomas Keller and the precise, military-cornered recipe he serves at Bouchon. I love Chef TK and Bouchon, but…ham, potatoes, cheese…. The recipe is attributed to Josie La Balch, chef/proprietor of Santa Monica’s Josie and Next Door by Josie (both faves). You can find the complete recipe by following the above link to the article. Below is my ever so slightly tweaked version (no crust and diced ham) – it’s easy, but as ever, make sure your ingredients are impeccable and be prepared to make no other quiche again. Ever. Boil potatoes for 4-5 minutes, until cooked but still firm. Drain and reserve. Saute onion in butter until soft, 5 minutes. Remove pan from heat and add creme fraiche, potato, diced Fontina, Parmesan, and diced ham, being careful not to break up the potato cubes. Set aside to cool for 10 mins. In a separate bowl, whisk together eggs and heavy cream, and gently stir into the potato-cheese mixture. Add salt and pepper. 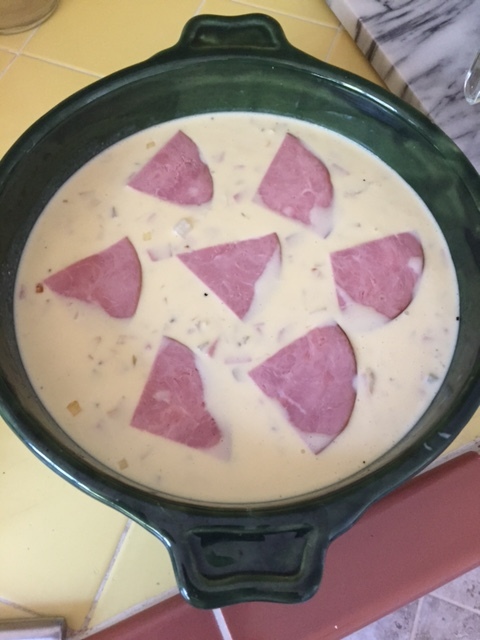 Pour filling into quiche pan, laying reserved ham slices over top (I try to go for decorative here). Bake at 350 for about 45-50 minutes. Filling should be set. A note about no crust: I was having a gluten-free friend for lunch one day (with fava beans and a nice chianti, ha ha ha) and, once tasted, realized I’d never miss the crust again. Yum…will definitely try this one. Thank you.